Sorry that we haven't posted anything so far this month. 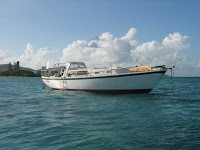 At the end of November, something happened after a power failure with the hotspot we were using in Long Bay, St Thomas. We were able to send & receive email fortunately, but we couldn't access the internet. We thought we would catch up on blogs when we reached Antigua. The Antigua Charter Yacht Show started on December 7th this year and we were really looking forward to it, as well as the sail from St. Thomas to Antigua. On the Sunday morning, shortly before dawn, we were dismasted which is a pretty major happening on a sailboat. Won't bore you with the details, but we safely motored in to Christiansted, St Croix Monday morning. Very happy with our Electric Yacht electric motor! Stuff happens and you just have to go with the flow. We've been toying with the idea of changing to a Junk Rig and now we have the opportunity to do so. So, in the next few days we'll be posting some photos from the St Thomas Charter Yacht Show and get back up to speed with interesting bits and pieces about chartering and charter yachts. We'd like to wish everyone a happy holiday season.